The seamless integration between Modernizing Medicine's Electronic Medical Assistant's (EMA™) and Kareo gives you an affordable and easy to use medical office software platform designed for your specialty. 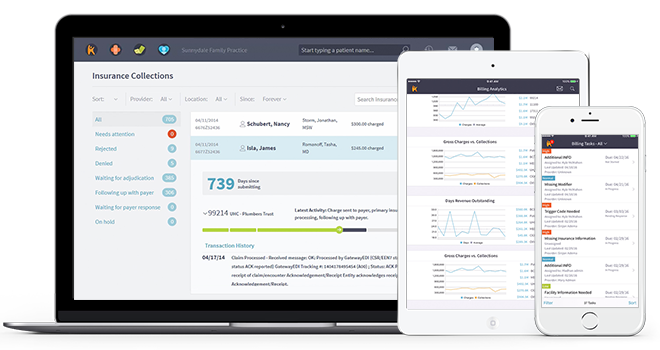 Easily customize, manage, and track your practice’s entire schedule, including providers, exam rooms, and specialty equipment with Kareo PM. Using Modernizing Medicine’s specialty-specific EMA you can quickly document histories and treatment plans with the native iPad app. Quickly create superbills with CPTs, ICD-9, and modifiers using specialty billing algorithms and generate an audit receipt of why each note was billed at the appropriate E/M code. Billing codes from Modernizing Medicine are instantly shared with your Kareo PM, making it effortless to scrub codes and electronically submit to insurance payers. Once claims are submitted, see claims status and access your electronic funds and electronic remittance advice (ERA) from your insurance payers within Kareo PM. Use Kareo PM to set up online bill pay, send digital statements, or print paper statements for patients paying copays, deductibles, coinsurance, or the full amount for self-pay scenarios. With Kareo PM, monitor what you are getting paid and how fast you are getting paid through Kareo’s medical billing reports and dashboards. Only enter patient demographics once. Seamless integration between EMA and Kareo ensures both systems share the same patient information. Here’s how Kareo Modernizing Medicine's EMA work together! Designed for medical specialties by practicing physicians, EMA intuitively adapts to each doctor’s unique style of practice and remembers their preferences. With simple touch-and-swipe technology and drawing capabilities at your fingertips in EMA, you can work faster and type only when you choose to.